Roaster ovens replaced labor-intensive wood stoves in working class homes as rural electrification made them obsolete in the 1930s. Not just oversized slow cookers, roaster ovens do everything from apple crisps to holiday turkeys. Modern cooks choose them for roasts and poultry because their compact interiors conserve moisture. Use cola or vinegar-based barbecue marinade and finish with your own recipe or sauce from a bottle. Clear some space in the refrigerator however; you’ll need to start the night before to cook up a mess of these tender ribs. Mix the dry ingredients and rub the ribs with the sugar and spice mixture. Spray the inside of the oven liner, insert the rack and layer the ribs with onions between each layer in the bottom of the liner. Sprinkle the vinegar and Worcestershire sauce over the ribs and add enough water, cola or beer to just cover the ribs. Put the pan in the refrigerator overnight to marinate. Remove the pan of ribs from the refrigerator. Let them sit until they come to room temperature as you preheat the oven to 250 degrees F.
Set the liner into the oven and add more liquid if needed to just barely cover the ribs. Cook for 2 to 2 1/2 hours until the meat is tender. Remove the oven liner from the roaster oven. 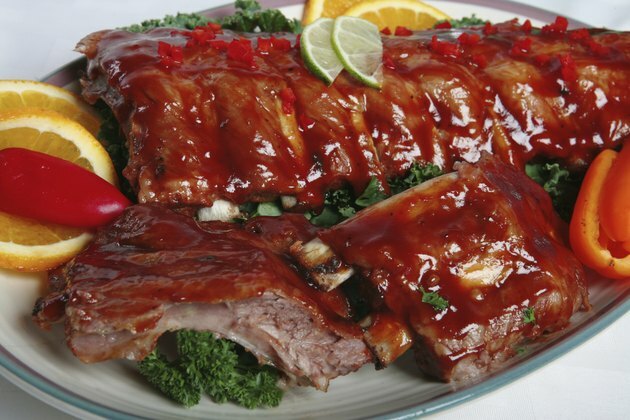 Take the rack of ribs out of the liner and put the ribs on a cutting board or large platter. Remove any loose onions from the cooking liquid with a slotted spoon and put them in a bowl. Turn the liquid out of the oven liner carefully. Wipe the liner dry with a clean cloth and re-spray its inside. Turn the heat in the oven up to 400 degrees F and replace the liner and rack. Place the ribs back on the rack with a pair of barbecue tongs, brushing each set with barbecue sauce as you set it in. Cover and roast the ribs for another 20 to 30 minutes until the meat browns and begins to pull back along the bones. Remove the ribs and serve with more sauce. Cut baby back rib racks into 3 or 4 sections for easier handling. Cooking liquid can be boiled and reduced to make barbecue sauce for the finish or use your own favorite sauce. You can also finish ribs on an outdoor grill. Put them over indirect medium heat for 15 to 20 minutes to provide a show for your guests. Do not boil the ribs. If the cooking liquid begins to boil, turn your roaster oven down. Handle the liner and pour out the hot water very carefully so that it does not drip back along the pan or counter onto the floor.